The traditional method uses a wooden pestle(where the dish gets its name from in a round about way) and a marble mortar. Start by pounding the garlic and salt until you get a smooth paste. Add the basil, a handful at a time, and keep grinding using a circular motion until each batch of the leaves is incorporated. 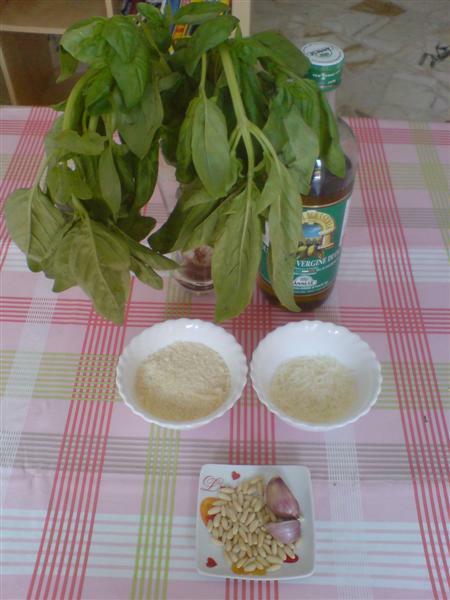 To preserve the essential oils in the basil, you shouldn’t be too rough with it. Add the pine kernel and grind some more. Add the cheese and mix well. 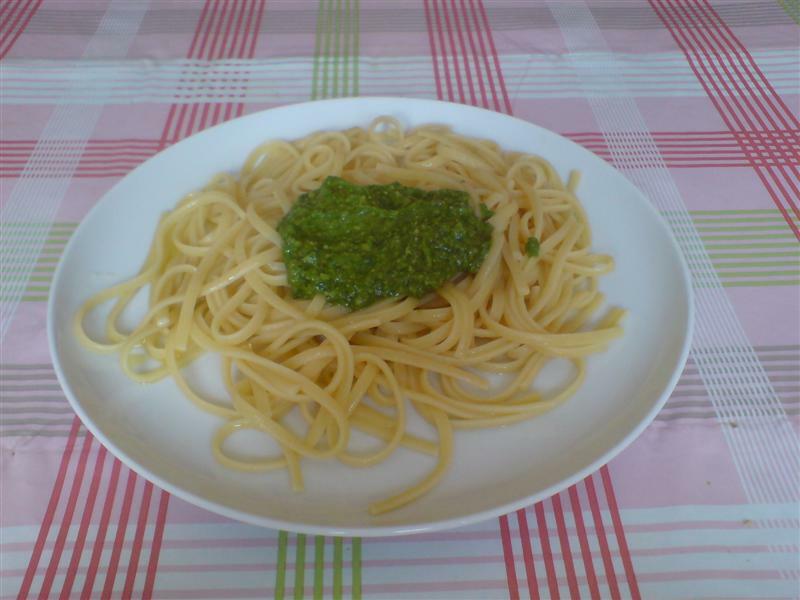 Add the oil, little by little, until the pesto has the right consistency – a matter of taste. Serve with pasta or added to minestrone. 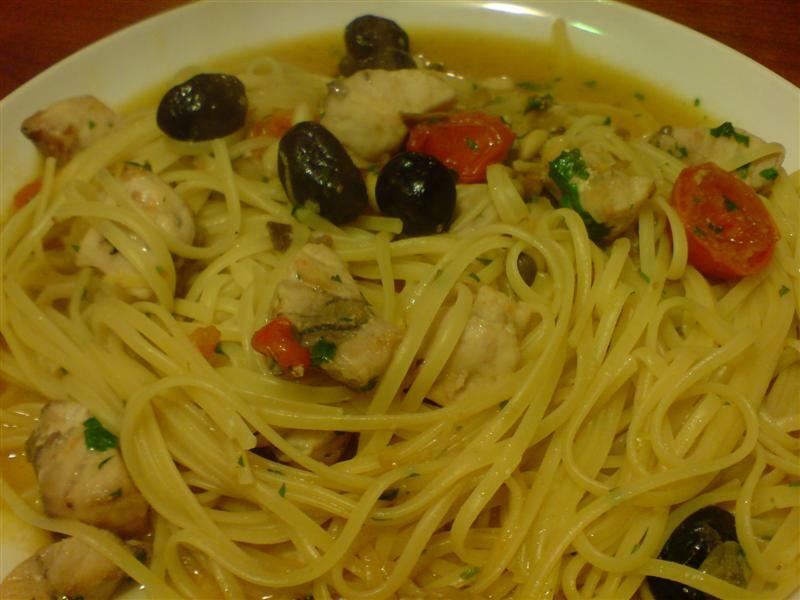 The recommended pastas are troffie, trofiette or trenette, but it goes with just about any pasta. I usually serve it with spaghetti or linguine. Bavette alle vongole e zucchine. 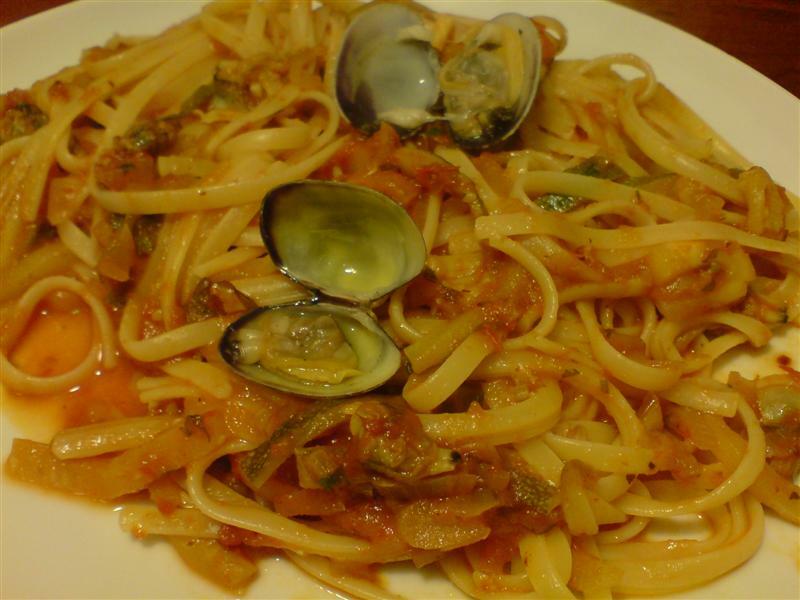 This is a nice alternative to the standard spaghetti alle vongole recipe. Serves 4. Open the clams by putting them in a dry pan over a high heat for about 5 minutes. Reserve any liquid that is produced. Remove the clams from their shells and put aside. Heat some oil in a pan and cook the shallot, chilli and garlic clove until softened. 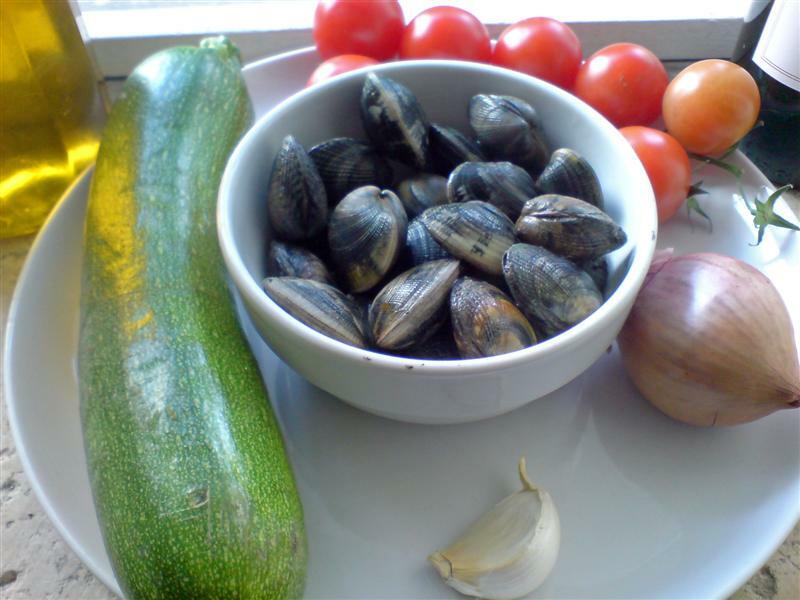 Add the clams, courgettes and parsley and cook for a few minutes. Add the wine and the liquid from the clams and allow to reduce for a while. Add the tomatoes, season with salt and cook until the sauce thickens – about 20-30 minutes. Cook the bavette until al dente, drain and add to the pan with the sauce and mix well. Bavette al tonno fresco. I’m not sure where this dish originates, but it feels like a Sicilian recipe due to the inclusion of tuna and pine nuts. It’s quite economical too as 200 grams of tuna feeds four people. My problem now is trying to think of a way to use up the other 800g I bought at the fish market this morning. I couldn’t resist, it was €2 a kilo 🙂 Serves 4. Fry the shallot and the garlic in olive oil until it starts to colour. Add the anchovies, half the pine nuts, the olives and the tomatoes. Cook for 2-3 minutes. 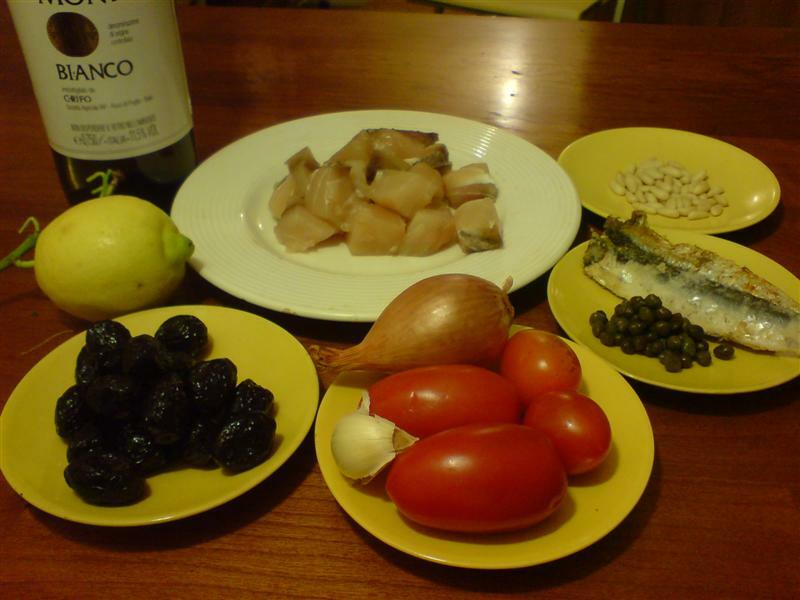 Add the capers and tuna. Cook for a further 2 minutes. Add the wine and allow to reduce a little. Remove from the heat. Add the lemon zest, parsley and the rest of the pine nuts. Meanwhile cook the pasta until al dente. Drain and add to the pan with the tuna. Return to the heat and mix well. 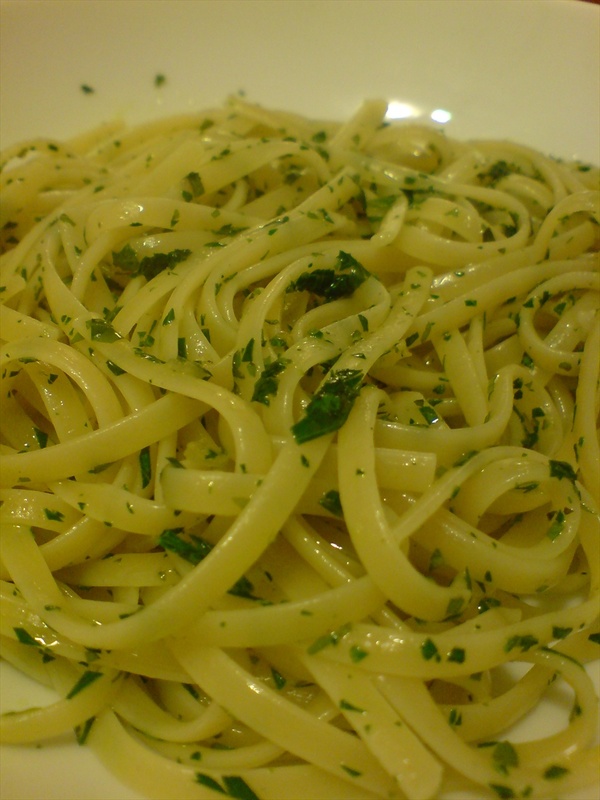 Allow the pasta to take up the flavours for a minute or so, remove from the heat and serve. Bavette Al Prezzemolo. This is a really nice, fresh tasting, summer dish. I first had it over ten years ago in Bergamo and have only just got around to tracking down the recipe. Heat plenty of oil in a pan, add the garlic and cook over a medium heat until it is well coloured. Remove from the heat and add the herbs. Leave to infuse for a minute or so. Add the cooked pasta to the pan and mix well. 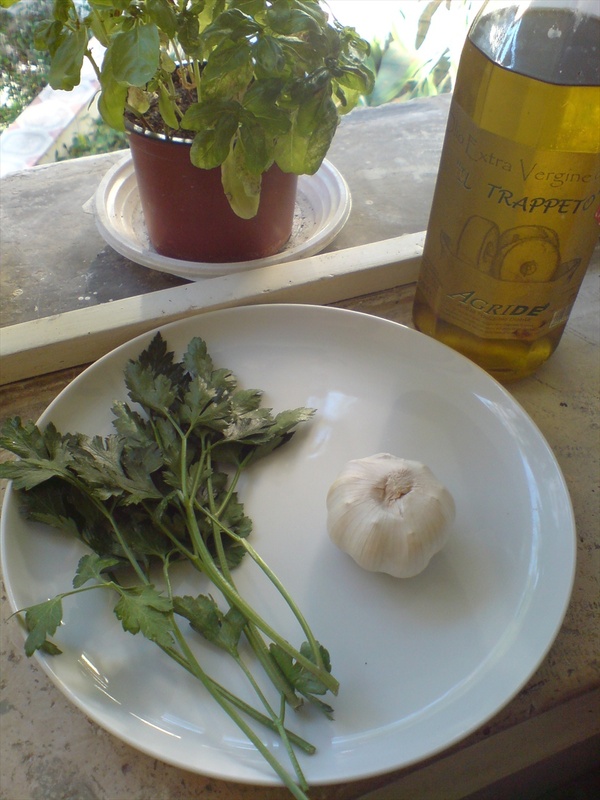 Variation: You can use other fresh herbs eg. mint, chives, dill etc. Whatever you fancy. Don’t try it with dried though. Soften the onions in a little olive oil. 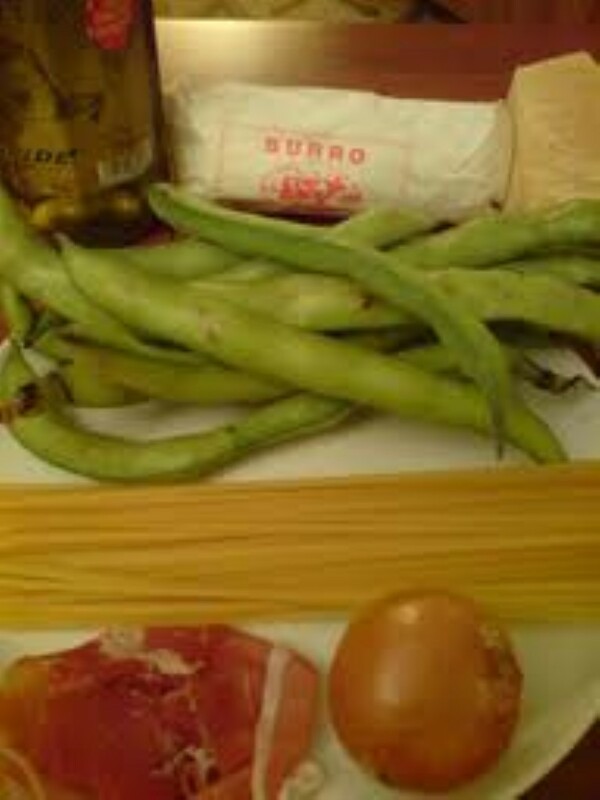 Add the beans and cover with stock. Cook over a high heat until the beans are tender – a few minutes. Season with salt and pepper, add the ham, stir and remove from the heat. Cook the pasta, drain and dress with the butter. 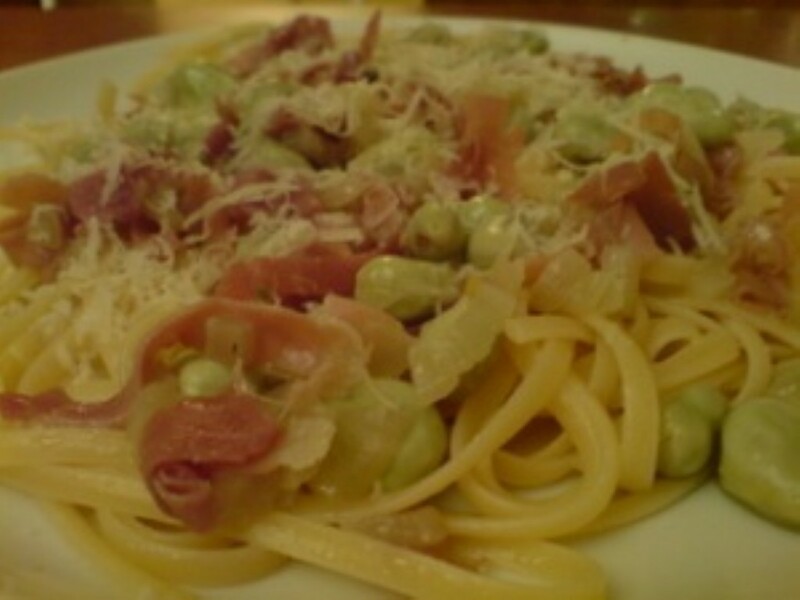 Add the beans to the pasta and serve topped with parmesan.